Happy Free UBERx Week! 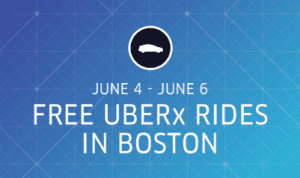 Free Rides from UBERx Through Thursday! Okay, I feel like I’ve been sharing Uber a lot on the blog lately, but I couldn’t help but share this one: Free rides this Week from UBERx (Uber’s new less expensive option!). You can grab a free ride starting today, June 4, 2013 to Thursday, June 6, 2013 until 8pm. To receive the free ride (up to $20) simply summon a UBERx from your Uber App for the promotion to automatically apply. Uber also tweeted this morning that Free UBERx week has been quite popular so far, so please leave extra time if you are in a hurry, especially during peak commuting times. UBERx is available for new and existing Uber members. For more information about this promotion, please click here. New users can sign up here (my referral link).